Roger Bacon (c. 1219-1292), commemorated by a plaque near the Westgate Centre, was a philosopher and alchemist. Having studied at Oxford and Paris, he joined the Franciscan order of friars in about 1257. He was often in trouble with the authorities, but his investigations into mathematics, optics, alchemy, and astronomy earned him the name "Doctor Mirabilis". His achievements include the magnifying glass and definitions of reflection and refraction. His Opus Majus predicted both cars and aircraft, and suggested that the world is round and could be circumnavigated. It is rather sad that the site of his friary is now completely engulfed by the Westgate shopping centre. 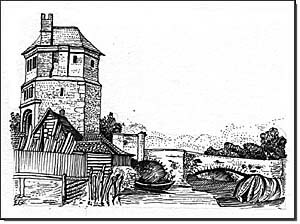 Bacon's study and observatory were over the gateway to Folly Bridge. This bridge spans the River Thames at the bottom of the hill from Carfax. The illustration is taken from an eighteenth-century print in the Mansell collection showing a view of the now demolished building from Christ Church Meadow.